Brett Luke | The Journal Gazette Jamie Schaafsma of the Komets fights for posession with Nick Latta of Wichita during the second period at Memorial Coliseum on Saturday night. Brett Luke | The Journal Gazette Shawn Szydlowski of the Komets battles Nolan Descoteaux for the puck during the first period at Memorial Coliseum on Saturday night. 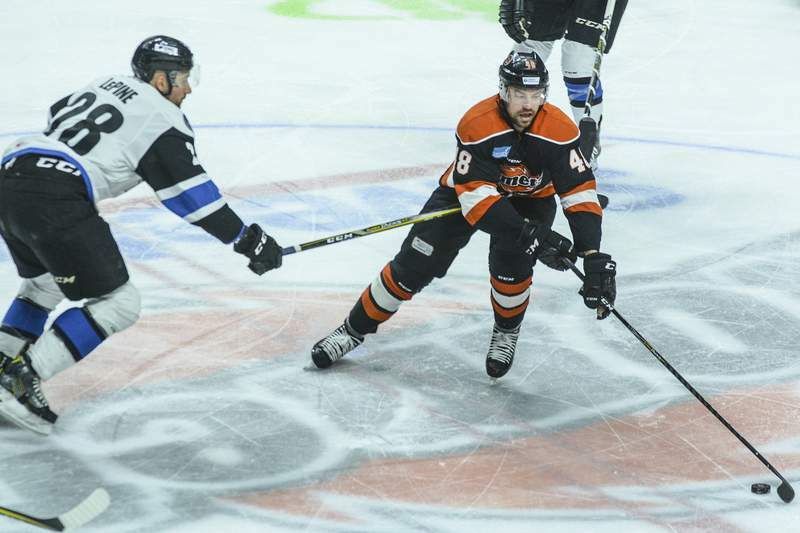 Brett Luke | The Journal Gazette The Komets struggle to stop Wichita’s advance during the first period at the Coliseum Saturday night. Brett Luke | The Journal Gazette Mason Baptista of the Komets battles Nolan Descoteaux of Wichita for control of the puck during the first period at Memorial Coliseum on Saturday night. 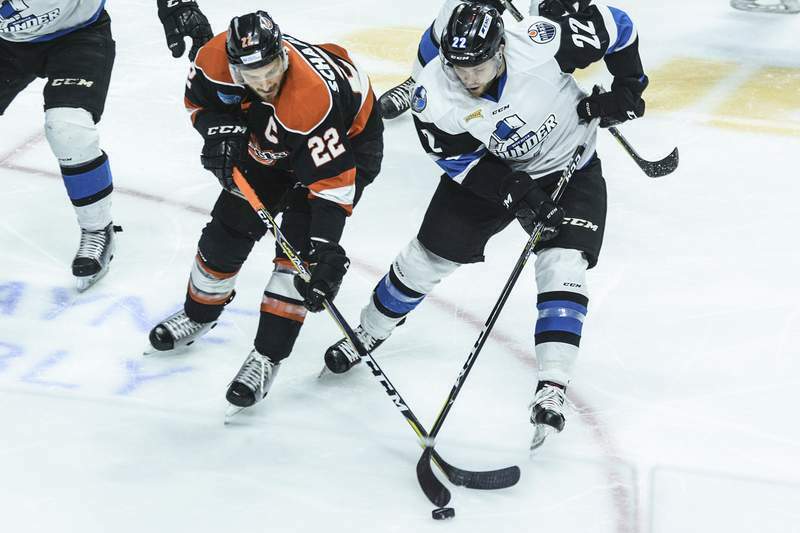 Brett Luke | The Journal Gazette Garrett Thompson of the Komets picks off a pass from the Wichita Thunder during the second period at Memorial Coliseum on Saturday night. Brett Luke | The Journal Gazette Wichita's Chad Butcher shoots during the first period at Memorial Coliseum on Saturday night. The last thing a hockey team wants to do is squander a hat trick. 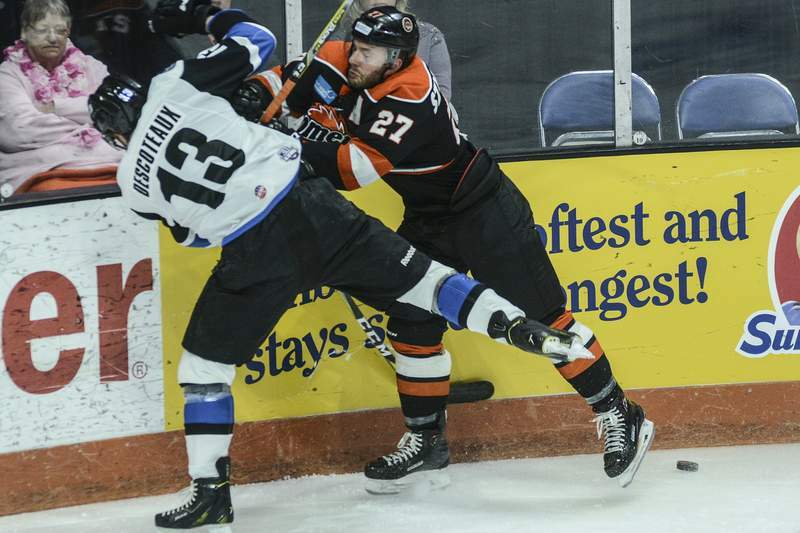 Gabriel Desjardins made sure the Komets didn’t tonight. 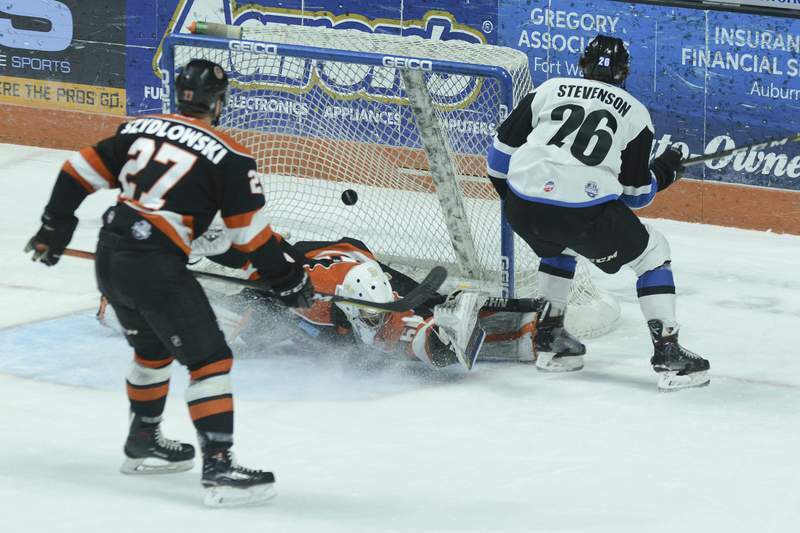 He snapped a shot into the net from 40 feet out while falling to the ice during the 3-on-3 overtime, cementing a 5-4 victory over the Wichita Thunder that saw six goals scored on special teams, three of them on power plays by Fort Wayne’s Garrett Thompson at Memorial Coliseum. 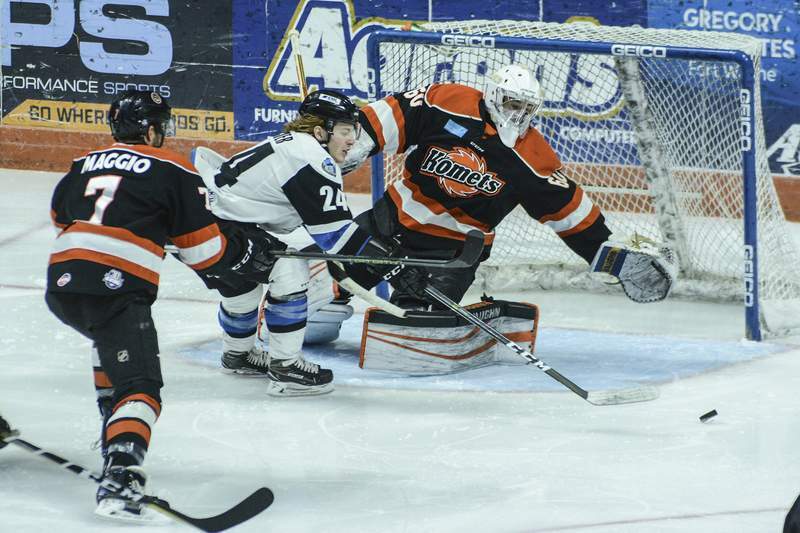 The Komets are 6-0 when a player has a hat trick this season. More importantly, the victory snapped Fort Wayne’s four-game losing streak. Two of those losses had come in overtime. It was Thompson’s second hat trick of the season – he had one Dec. 6 in a 5-2 victory over the division-leading Toledo Walleye. Desjardins is the only other Fort Wayne player with two hat tricks this season. 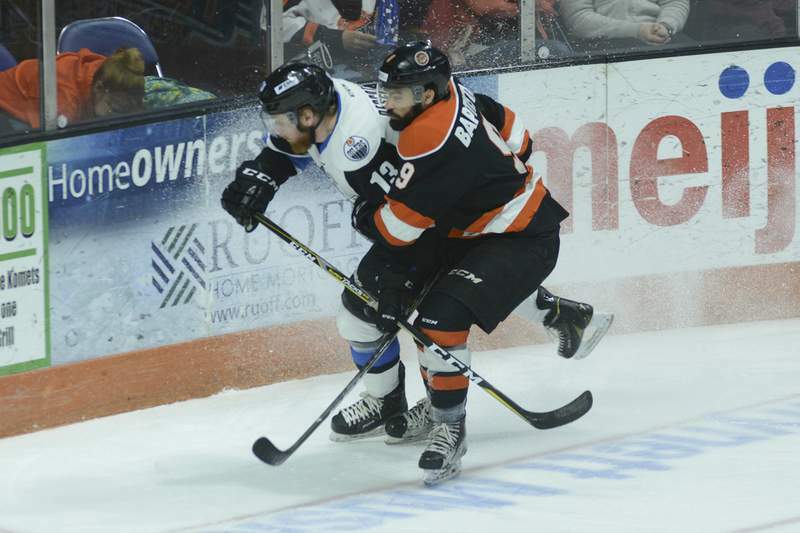 A double-minor penalty on Wichita’s Jeremy Beaudry and the resulting four-minute power play didn’t pay off the way the Komets would have hoped; by the end of it they were tied at 1. 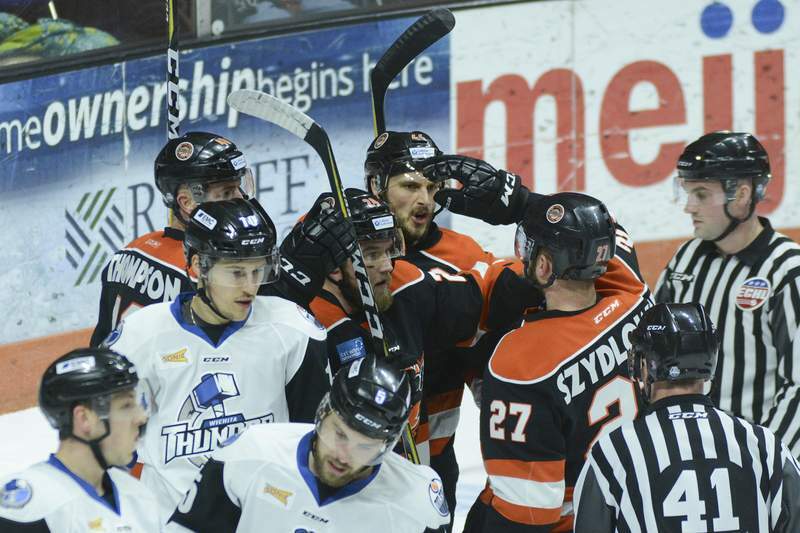 Though Thompson scored on a one-timer at 13:51, thanks to captain Jamie Schaafsma’s setup from the goal line, the Thunder answered 29 seconds later on a Ralph Cuddemi short-handed goal. With Beaudry again in the penalty box, this time for holding, the Thunder again got a short-handed goal with Dyson Stevenson netting a shot at the end of a 2-on-1 rush. Thompson scored a power-play goal identical to his first, except this time it was set up by a Dennis Kravchenko pass to tie it at 2 at 1:13 of the second period after Ryan Van Stralen got penalized for tripping by referee Stephen Thomson. Thompson’s third goal came at 4:55, when he fired a low shot from the right circle past goaltender Nick Riopel with Wichita’s Etienne Boutet serving a penalty for delay of game because he’d shot the puck into the stands. The sixth goal of the game, which tied it at 3, was also the sixth special-team goal of the night. Wichita’s Mark MacMillan sent a shot from the right circle past goalie Garrett Bartus with Ryan Lowney serving a interference penalty. Fort Wayne’s Daniel Maggio netted a shot from the blue line 3:42 into the third period – the first goal of the game not on special teams – but Wichita’s Chad Butcher answered at 10:56. Fort Wayne outshot Wichita 35-33 in regulation time.